On one evening, she and some colleagues went to a restaurant with a medieval theme with music and other entertainment. Actually, the food consisted of three choices: A Chicken and duck platter, Roast Pig knee (which my wife had), and a Vegetarian Platter. All were done in medieval style and were served with huge great hunks of bread that diners could tear apart with their hands. Next was the ‘Dvur’ Restaurant, which served Czech classics. As with all restaurants she visited, the beer was cheaper than soft drinks. This was a Beef Goulash. My wife said the beef was exceptionally tender and the gravy really delicious. The things on the side that look like bread are actually a type of sliced dumpling. This is the inside of the ‘Gate Restaurant’. It served Italian and American fare, but also some Czech dishes. Everybody shared some nicely arranged appetizers. My wife had Steak Tartar after the appetizers. I am not terribly fond of this dish but my wife orders it frequently and says this one was very good. Lastly, my wife and one of her colleagues were served a Pork knee that was cooked with onions and beer and served with mustard and some pickles called ‘Ram’s horns’. She said this was much better than the version at the medieval place and that the skin was beautifully crispy. My wife can’t wait to get back to Germany to have another ‘Schweinshaxe’, which sounds to be the same thing as the pork knee. Can’t remember the name of the restaurant but it used to be a railway station somewhere in or near Dusseldorf. This looks so good. I adore the look of the antipasto plate and pickled vegetables! How lovely to share your wifes trip with us. Looks like your wife had a fun trip!! I’ve only been to one Czech restaurant but I became addicted to those bread dumplings. They’re perfect for sopping up all the sauces. And then you don’t have to eat for about a week afterwards. 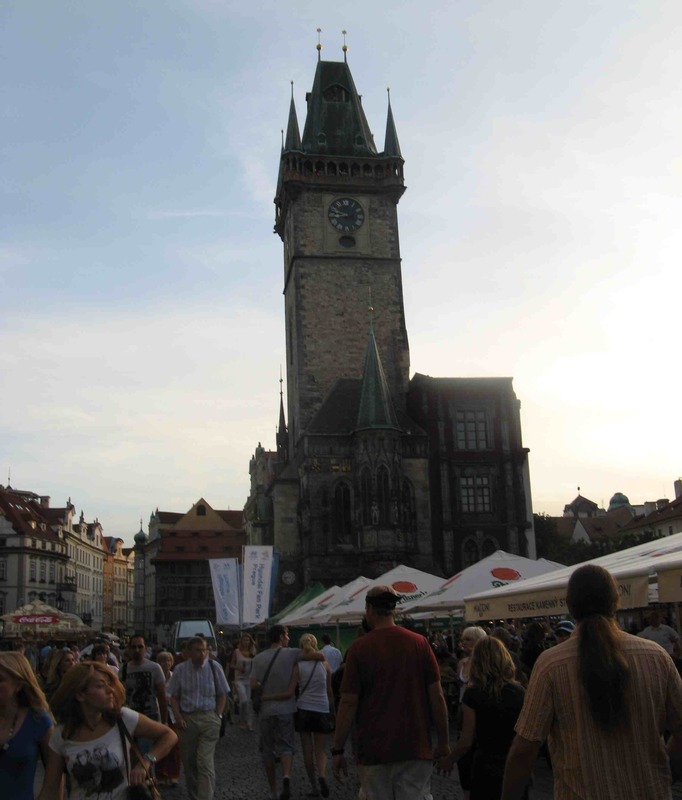 From “the wife” aka Darlene: I just LOVED Prague. It is a wonderfully clean city with extraordinary food and friendly people! I would recommend this as a travel destination to anyone. The food is cheap and the beer cheaper and both are WONDERFUL. You can immerse yourself in a wonderful culture but be warned – just to see the city of Prague can take three days – never mind the awesome country-side whicfh I, unfortunately, did not get to visit! Darlene! I am so glad that you had a wonderful time in Prague! Isn’t it like a little jewel-box? And you are right: it is freakishly clean. Like Epcot Center clean! It looks like you had fun at that Medieval-themed restaurant. Who would have guess that belly dancers were big in the 1270’s! Thank you MixerUpper and to everybody who posted here. Yes, I was on very “strict instuctions” about pictures to take and to try ALL kinds of different food – LOL. This was an easy assignment, though, because I just love to try out new things. I would put most Chzech foods on my “comfort” foods list as they are so meaty and lovely (and the dumplings to die for). Perhaps not the best for vegetarians but I’m a carnivore at heart! Thank you for posting the pics Dar, it looks like you had a wonderful trip. I wished I could have gone just for the Pilsner!